Hello there, thank you so much for your emails and comments about my new look. I am so very happy with it and I cannot stop hovering my mouse over the moving nav bar at the top just how posh is that? Michelle at Laycock Designs is a truly wonderful and talented lady blessed with the patience of a saint, believe me I know this as I have really tried it over the last few weeks, I am a nightmare at deciding stuff but Michelle had kept me on the right path with her extended knowledge in web design. I would totally 100 trillion % recommend Michelle and Heather to anyone thinking of treating themselves to a blog/website makeover, they are both incredibly professional and very, very good, they sure know their stuff. I do not think I have ever used a punch as much as this bird one. I have made Birthday cards, Christmas cards, bereavement cards so lovely and so very versatile, I adore it. Early Espresso, Cherry Cobbler, Old Olive and Baja Breeze were the colours used and they look so happy together, very fresh and festive. 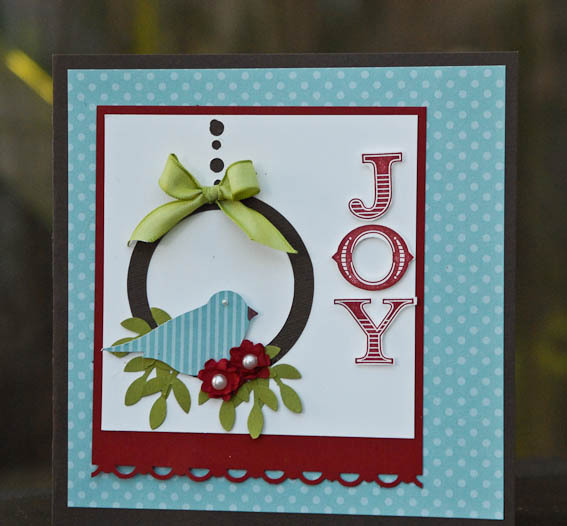 The JOY word is from the Welcome Christmas set. The designer paper in Baja Breeze is positively yum. A touch of Old Olive was added with the tafetta ribbon and card stock for the branches. Here's a nice close up of the little flowers in Cherry Cobbler which were made using the Boho Blossom punch. I only wish I would have used a slightly bigger pearl for the eye of the bird is sort of lost in that smaller size, I will change it I think. So my new look causes for a celebration. I am offering my blog readers the chance to win some yummy Stampin'Up! products. In order to qualify you will need to subscribe to my blog become a follower and leave me a comment answering what is your favourite Christmas colour combination. While you are here you might want to subscribe to my mailing list as well, you will find the box top left corner of this page. I have some exciting things planned for 2011 so you might want to be on my list to find out about them. The Giveaway closes on Wednesday December 15th at 12 am. The winner will be determined by a random number generator and announced on Thursday 16 th December. Want to see what's up for grabs? Have a peek at this yummy lot. A full stack of 12x12 Sweet Pea designer paper, yummy colours and patterns all double sided sheets wonderful quality thick enough for gift bags and handbags, scrapbooking card making etc. A Stamp A Ma Jig- wonderful tool should be part of every crafter's arsenal, this is a positioner that will allow you to stamp straight every time, or to stamp something in the exact desired spot, ideal for the two step sets as well for perfect alignment. Two full reels of ribbon- Certainly Celery poly twill ties like a dream and So Saffron gorgeous grosgrain. 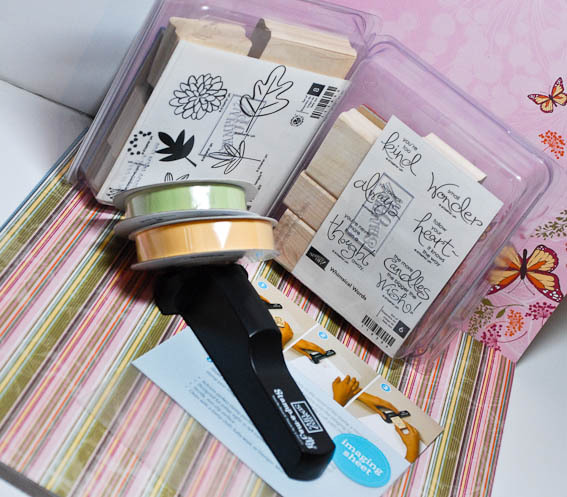 Also included in this giveaway are not one but 2 brand new stamp sets. The one on the left is a level 2 retired hostess set and the one on the right is a useful sentiment set that just about covers every occasion, yummy font as well. Let's see if I can reach 360 subscribers, tell your friends and GOOD LUCK !!!! Classic combo for me - Cherry Cobbler and Crumb Cake! Maybe with a bit of Dazzling Diamonds for added sparkle! LOVE the new blog look, very jealous! Love the new look Monica. I like snowy, icy Christmas Cards and I am leaning towards Marina Mist and Bashful Blue, with Whisper White of course. i love your new blog so funky!!! i think my colour combo this year has to be crumb cake and baja breeze!! Loving the new blog look huni... very yummy! Love the new look blog Monica, it's fabulous. My favourite Christmas combination, well it has to be cool blue and silver. 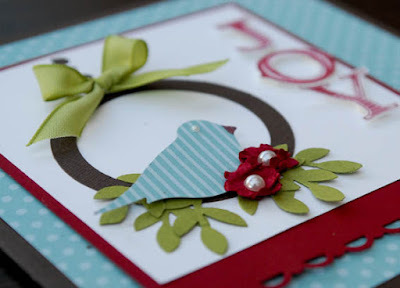 I have to say what a gorgeous card, my favorite part of your new wardrobe for me has to be those bird rings with oh so pretty flowers draping over them!.. Hadn't seen new look before as I read in Google Reader, it's fab. I love purple and silver best although I've gone all real red and old olive this year. Cant wait to get my hands on that punch!!! Love the new look and the matching card. I still go for traditional red and gold. Great new website. Have seen your advert in 'making cards' magazine. Great idea- hope it brings in some interest. SU definitely needs some magazine advertising. My favourite Christmas colours at the mo are old olive and real red- am a tradtional girl. Love the new look and this card is stunning! I'm a traditional for Christmas colours ... red, green and golds ... very sumptuous. Garden Green, Baja Breeze, Blushing Bride, Real Red. What a great new look on your blog love it! I am already a follower and my favourite Christmas colour is Cherry Cobbler but that's today and have to say it changes daily lol. Hope to see you soon have you fixed the dates yet for Stamp with Us? Hadn't seen your new look blog before as I read in Google Reader but it's gorgeous!! favourite christmas combo is whisper white and bashful blue for that snowy icy look. Thanks for the chance to win some fab SU goodies. Your new blog is so professional looking - gorgeous. My favourite Christmas colour combo is simple - whisper white and real red and what would a Christmas card be without a hint of Dazzling Diamonds! Loving your new look blog and the card is just fab! I followed your blog. My favorite Christmas color combination is silver and blue. Gorgous new layout Monica. Your blog, as always, is incredibly inspiring. My favourite 2010 Christmas colour combo is Cherry Cobler and Very Vanilla. Been making all my cards this year with it. Hi Monica, love the new look site. My favourite Christmas colour combo is: red and green. Hi Monica, love the new look site. My favourite Christmas colours combo is green and red. I like Cherry Cobbler and Old Olive with a touch of Choc Chip or Crumb Cake, so pretty much traditional red and green. New blog make over is gorgeous btw! My colour combo Crumb Cake/Early Espresso/Cherry Cobbler - Traditional with a hint of earthy! Kind of like me I guess!!!!!! LOVE your card; I thought I was done with Christmas cards this year but you've just changed my mind! My combo this year was certainly celery, real red & good old vanilla; keeping it old school! Thanks for a chance at yummy blog candy! Not sure if I succeeded on the Follower subscription but love having found & Subscribed to your blog through IStamp! I am loving Cherry Cobbler with Crumb Cake & Artichoke! Big thank you to Nancy's IPick's! Beautiful card! My favorite would have to be Baja Breeze & Real Red. Thanks for the chance to win. Love, love, love the new look of your blog, so classy. I really like your new blog. For Christmas, I'm very traditional & like red & green with a touch of gold. Just found your blog via Nancy Riley. Great stuff you have!!! My Christmas fav this year is cherry cobbler with old olive and very vanilla. It may sound strange...but my favorite combination is blue and white for my Christmas cards. I like simple two color combos. Love your new blog, and card. I go for red and green with a bit of gold.